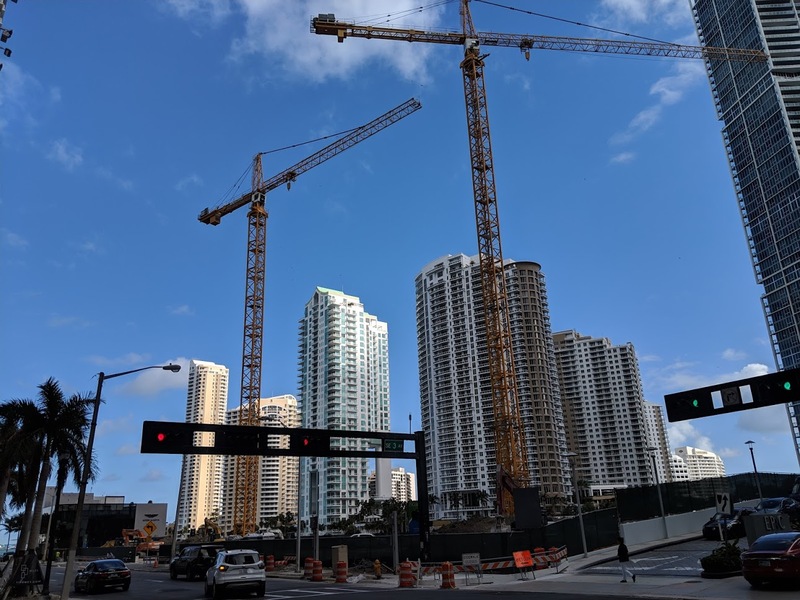 Two tower cranes have been installed at the Aston Martin Residences site. 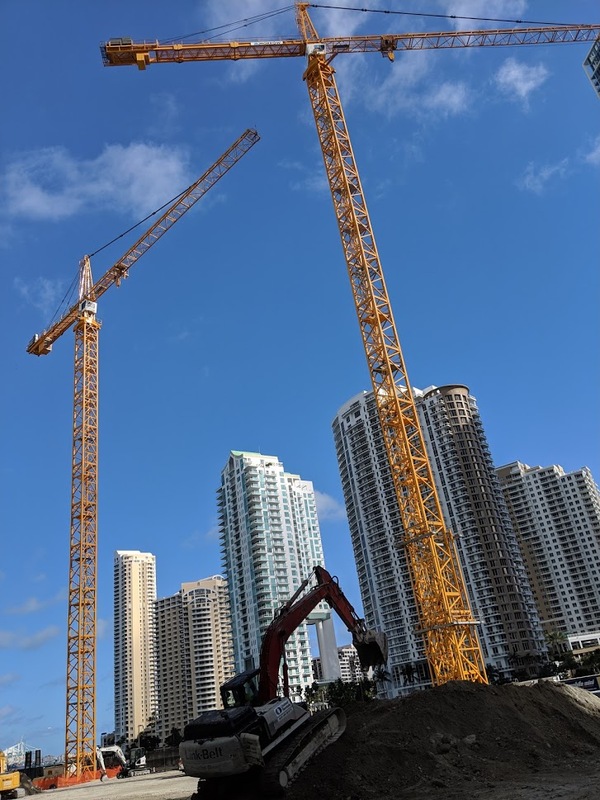 The cranes will become among the tallest ever installed in Miami, at 889 feet and 851 feet above ground. 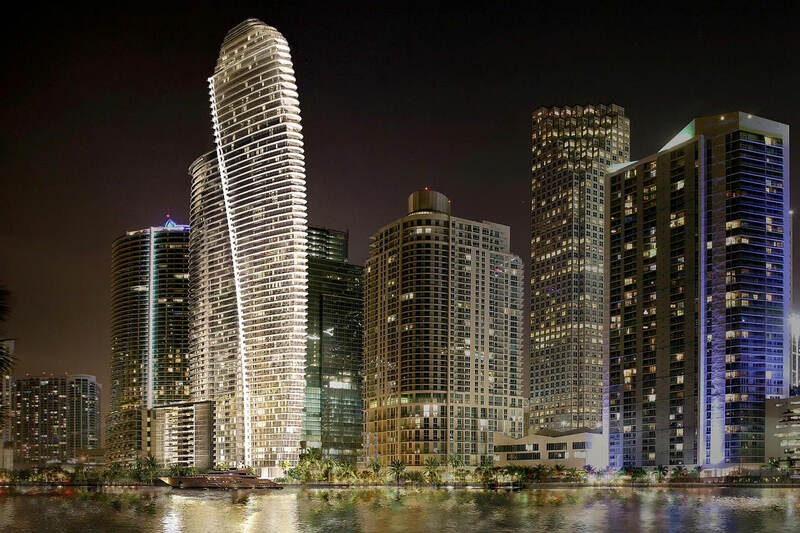 Aston Martin Residences is set to rise 66 stories, or 816 feet above ground. 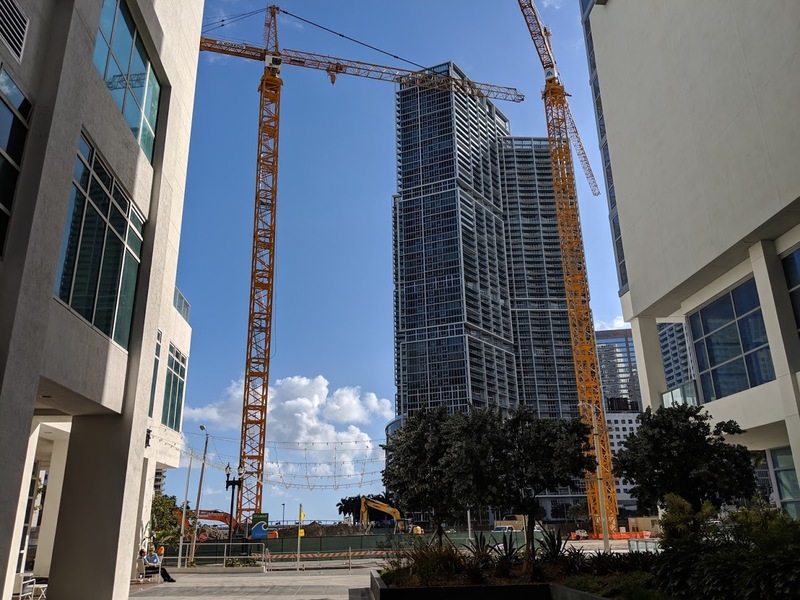 There is only one building in Florida currently taller, Panorama Tower. In December, the developer secured a $200 million construction loan. Over 40% of 391 units were sold, the developer said at the time. 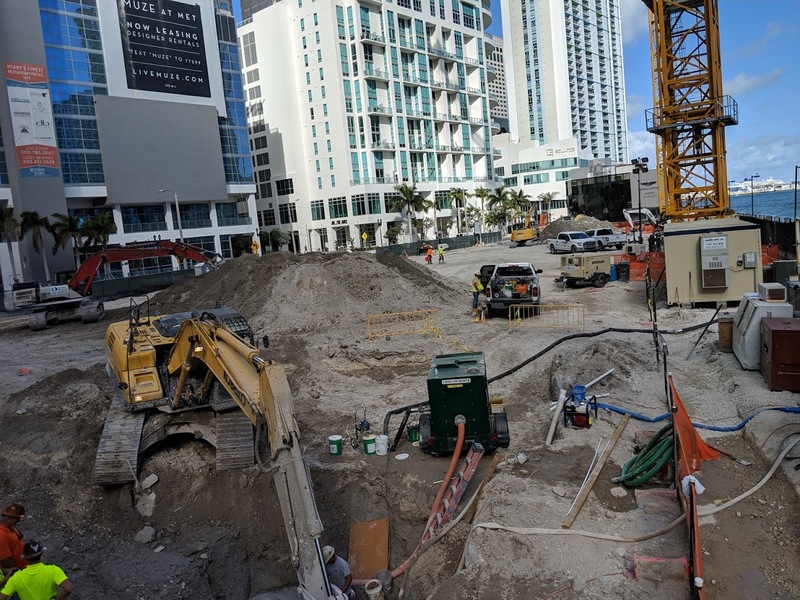 Vertical construction is set to begin in July 2019, following a foundation pour. Completion is scheduled for 2022. The traffic for the next few years in this area will be chaotic but that is the price of progress. Once completed this building will be beautiful. It almost looks like a huge sailboat sailing out of Brickell. Coming from Brickell for my morning commute, between the Brickell Bridge opening all the time for over 8 mins each time, trucks parked on the right lane by the Epic for deliveries (not sure why police don’t give them tickets), and I’m pretty sure Aston will block the right lane for years until completion… the traffic in this little section will be a complete nightmare. It has cranes now, yep the naysayers failed again. They most likely will be right on the downtown convention center. I can afford a Saturn residence…..
Last photo of the site looks like an accident waiting to happen… I wouldn’t like to be that guy at the bottom of an excavation without a benched wall and a track hoe on the ledge above. Even worse, you can see they’ve been fighting the water coming in. Look at the size of the pump for such a small excavation. The little trash pump next to it couldn’t keep up eh? Perfect conditions for un-stabilized soil. Run guy in the trench! That’s an excavator bro. But yea I understand exactly what your saying, its ridiculous how some foremans put there workers lives in danger. A beautiful building will be placed in front of several other not-so-beautiful buildings. Doesn’t really change the view from Icon. Noise will be an issue, though. Noise? Has anyone lived or been to NYC? People in Miami are becoming a little spoiled when it comes to noise and traffic. Better than noise from Ultra. “Vertical construction is set to start in July 2019”? You mean is going to take another five months for vertical construction to start? Foundation has already been poured and the cranes are up in place. I think this is a mistake. 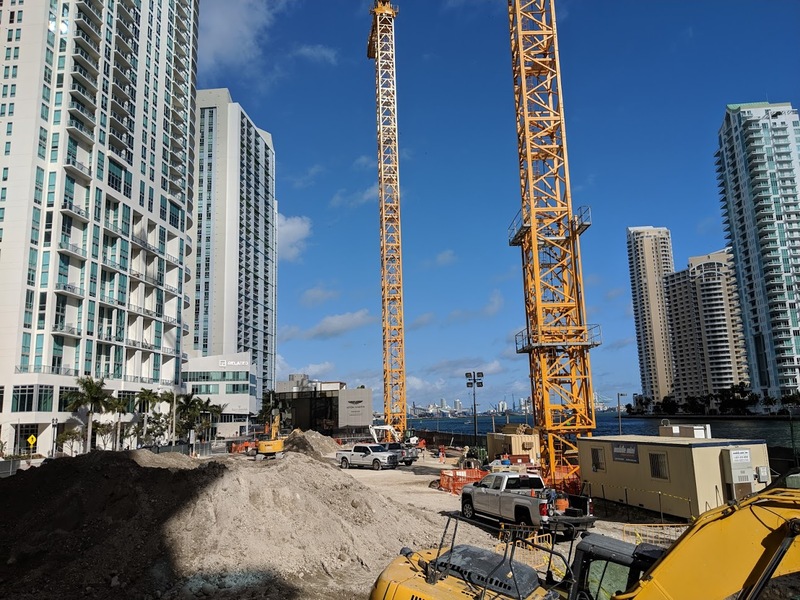 Vertical construction should begin this month. It literally has cranes installed now. When they top off and residents move in then I’ll believe it…maybe! I’m being sarcastic people shh! !